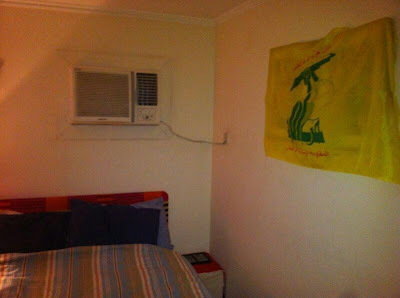 Image of the apartment of the deported foreign kindergarden teacher appear showing hanging of Lebanese Hezbollah flag." Erin is not the first expat working in education to be forced to leave Bahrain. In 2011, Australian teacher Tony Mitchell was deported from Bahrain after posting videos of the uprising to his Facebook page. Dr Mike Diboll was also forced to leave the country, after being an eyewitness to a brutal attack on students at the University of Bahrain. His employees subsequently told him that they had monitored his internet activity and found him to be "in breach of contract". "The Ministry of State for Communications (MoSC) received a complaint about an individual using Twitter and a number of websites to publish articles on Bahrain that were deemed to incite hatred against the government and members of the Royal family, as well as spreading misinformation and encouraging divisions in Bahraini society based on religious sect. The American woman, who writes under an undisclosed pen name, violated the Labor Laws of Bahrain by working illegally as an unaccredited journalist while employed as a teacher. She has published a number of articles for online journals including Muftah (where she holds the titles of Co-Editor and works as a reporter), Lebanon’s Hizbullah-linked As-Safir newspaper and the illegal Bahrain Center for Human Rights Newsletter, among others."